Family entertainment options are numerous. You can take your kids to a sporting event, a movie, the zoo or any one of a seemingly endless array of options. The problem with family entertainment has always been that it can be relatively expensive. Just taking yourself, your spouse and your kids to a movie can cost upwards of $50. With that in mind, mobile phones have become a new avenue for affordable family entertainment. 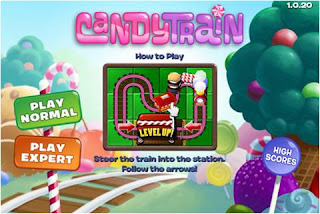 Mobile gaming is social, easy for family members of all ages and a cost-effective way to keep your family entertained. No matter what cell phone plans you and your family members subscribe to, these games are a great option that the whole family can enjoy. This game provides a great entertainment option for kids no matter what cell phone plans they have. It's rated as being suitable children as old as six. It's a puzzle game where a train moves on the screen, and the player moves the track in front of it in order to keep it moving along. Kids can get bonuses with things like giant candies and sweets. 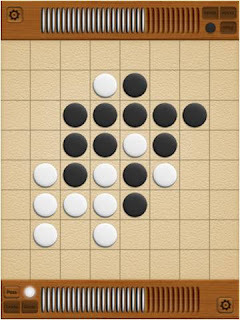 As the child progresses through the game it becomes more challenging, so the game grows with the player. It's a very easy-to-play game that can help develop a child's strategic thinking. With GameRoom, five board games are made available. All of the games feature multiplayer, so two or more family members can get in on the action. GameRoom is geared more towards iPad users, but should be suitable on a mobile phone as well. Unfortunately, it lacks solo and online play. However, when more than one family member wants to play a game, GameRoom provides a great outlet. This game is a game that lets family members play against one another or by themselves and against the clock. 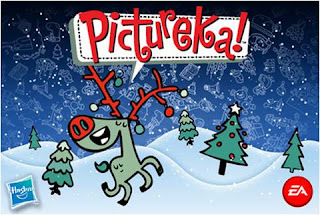 Like the board game Pictureka, the app is based on finding matching cards. It can teach younger players more about systematic thinking and is very easy to play, making it a family-friendly experience no matter a player's age. 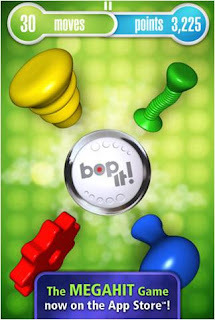 (Courtesy of iTunes Store) Bop It! The Bop It toy has been around for more than a decade, and now the experience is available to families through mobile devices. It's a simple premise that follows the same structure as the physical toy, where an announcer provides instructions on what to do. One key difference is that while the physical toy instructed players to flip or smack the toy, the digital version is altered for players to tap or swipe. It's an entertaining app that younger family members especially will get a kick out of. While it's not the most educational app ever invented, it will keep younger players smiling. 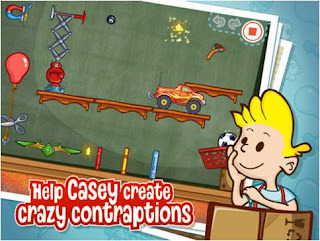 If you know what a Rube Goldberg device is, then you know how to play Casey's Contraptions. The game is centered on physics puzzles in the same vein as Rube Goldberg devices. Players are given a set of tools for each level and then have to find a way to accomplish a given task. It's an educational experience, with a focus on developing kids' strategic thinking abilities. While it's simple enough for very young players to enjoy, it provides enough of a challenge that even adults will find themselves intrigued by the various scenarios presented by the game. Overall, it's one of the best family-oriented games available on mobile devices. All of these apps manage to be very entertaining while also stimulating young minds. Thanks to games like these, you never have to worry about keeping the kids in your family entertained. Whether you're going on a long trip or just looking for a way for your family to bond on a rainy day, these games will get the job done. This is a guest article by Ruben Corbo, a writer for the website Cell Phone Expert where you can compare cell phone plans.